Here we are again at Kursk in 1943: 'The Greatest Tank Battle'. 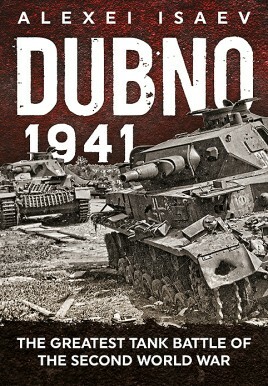 Wait a minute, the name of the book is 'Dubno 1941, The Greatest Tank Battle of The Second World War'. Could we have been mistaken all along? Turns out, yes we were. In 1941, 800 tanks of the German Army Group South, and 3,000 tanks of the Soviet Red Army Kiev Special Military District collided into each other. The Germans were trying to get some running room to break out into southern Russia, while the Russians desperately tried to stop the German flood. The author and translator have done a fantastic job of bringing these little known battles to light. Many times the fighting in central Russia takes a front seat to the other two fronts in 1941. The Soviet forces were untried and faced German troops who had almost two years of war behind them. The Soviets forces were also hamstrung by two other factors. One, the paranoid psychopath Stalin had gutted the Red Army's officer corps in the purges of the preceding years. Two, the Red Army, which was actually technically ahead of the rest of the world in 1938 with their armored formations, had actually broken them up and changed direction after the Spanish Civil war. Due to the German armored victories in 1940, the Soviets were in the process of switching back to their pre-1938 ideas. So the Red Army was already fighting on its back foot and with one hand tied behind its back. The author's premise is that the Germans were able to deal fairly easily with the Soviet armor because the German armored (Panzer divisions) were combined arms units, and not just tank heavy units like the Soviets. The Germans had to deal with not only much larger numbers of men and machines. The newest Soviet tanks (T-34, KV-1) were technologically much more advanced than the German ones in armor and armament. The Germans were lucky that most of the Soviets' newest tanks had just been assigned to their units, so the crews were unfamiliar with them. This, along with the fact that all German tanks had radios and almost none of the Soviet tanks did, allowed the Germans to deal with the changing situations of battle. The Soviets, on the other hand, made battle plans before contact and then stuck with them come what may. A lot of people are not familiar with the adverse effects Stalin had on the first six months of the war. Stalin was just as foolish as Hitler with a rash of 'stand and die' orders early in the war. However, and a bit unbelievably, Stalin learned to trust his generals' judgment. We know how that worked on the German side. The author shows us that the southern part of the Soviet Army was the strongest and most able on June 22nd 1941. The author believes that the Soviet self sacrifice in these early battles enabled the Soviets to win the war. The author also makes a good argument that the frontier battles of 1941 were the swan song of the German infantry. He believes they were bled white, and that their capabilities just continued to grow worse as the war progressed. In the author's 'conclusion', he shows not only the Soviet mistakes, but also the German ones. "A) The armor on the engine and on the tank body could be penetrated from a distance of 300-400m with a 37mm armor piercing shell. The vertical plates on the sides could be penetrated by a 20mm armor piercing shell. When cresting a ditch the tank digs in due to it being low set. Contact with the ground is insufficient owning to the relative smoothness of the tracks. B) The driver's forward hatch caves in after a direct hit from a shell. C) The tracks are weak and any shell would be able to break them." This book is filled with pictures from the battle, and also has a good number of maps to help the reader visualize the different actions. It is another superb Helion & Company volume to add to your collection.